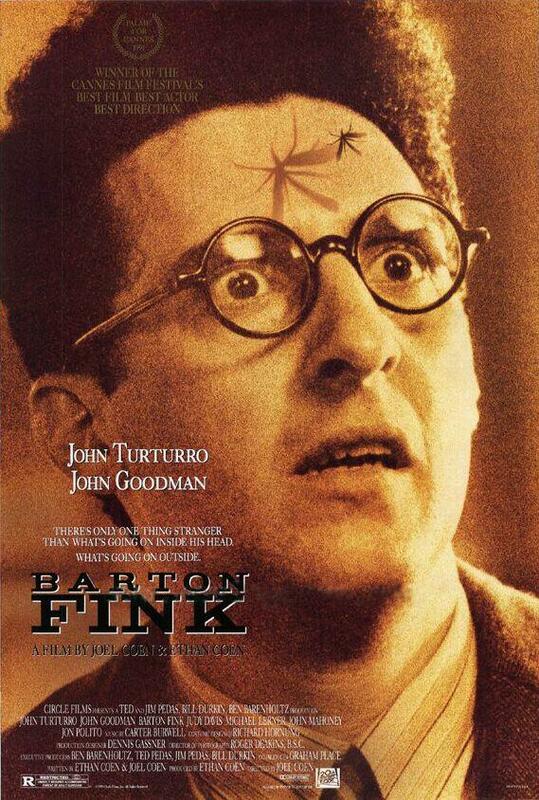 Barton Fink is set in the 1940s and stars John Turturro as a writer who’s play has just won audience and critical acclaim in New York. So much acclaim that a movie exec in Hollywood offers him a job as a contract writer. His first job is a B-Movie, a wrestling picture, and he’s having trouble coming up with the inspiration to get the job done. He’s living in a dumpy hotel and his next door neighbor turns out to be a boisterous insurance broker named Charlie Meadows (played by John Goodman). Barton takes a liking to Charlie rather quickly. Barton has this idea that plays and films should be about the common man and reflect the life struggles that everyday people go through. Despite telling this to everyone he meets, Barton never seems to listen when anyone wants to tell him their story (especially Charlie). The movie is pretty straight forward until about an hour into it when suddenly things take an unexpected turn. Barton tries to recover from this cataclysmic event, but it’s not until he embraces his friend Charlie’s story that things start flowing for him. There is some strange symbolism in this film, and again I feel inadequate for not being able to decipher all of it. There’s a certain painting that sparks Barton’s fancy—a girl sitting at the beach that he stares at for hours while he’s trying to write his script, but I’m not sure what it means. Regardless of whether you understand the subtle nuances of the film, it is an enjoyable movie. The characters are likeable, even the crazy Hollywood executive and Barton’s drunken writer friend. The story sounds dull but is portrayed in that classic Coen brothers style where everything seems normal at first, but just slightly off kilter on closer inspection (example: the elevator operator who is as mechanical as a modern button based elevator, or the bellhop who inexplicably comes out of a hole in the floor when the hotel bell is rung). This gives the movie an interesting edge that drives the story forward and kept my interest going. I would definitely recommend this movie—it is wonderful and weird.